African Americans have a proud history of military service in the United States, including during the Civil War. In all, during the Civil War, the U.S. Colored Troops mustered 138 infantry units, 14 heavy artillery units, 6 cavalry units, and numerous other independent or unassigned companies. Over 175,000 African Americans served as part of the U.S. Colored Troops. The records related to the U.S. Colored Troops offer a fascinating look into the experience these men had during the war and, with some of the records, their life after the war. On 17 July 1862 the U.S. Congress passed--and President Lincoln signed into law--two acts that changed the future of the Civil War. The first act, titled "An Act to suppress Insurrection, to punish Treason and Rebellion, to seize and confiscate the Property of Rebels, and for other Purposes" (commonly called the "Second Confiscation Act"), authorized the President, "to employ as many persons of African descent as he may deem necessary and proper for the suppression of this rebellion, and for this purpose he may organize and use them in such manner as he may judge best for the public welfare" (12 Stat. 589). This clause referred specifically to those slaves "confiscated" from disloyal slave owners in the rebellious states. These slaves became commonly called "contraband" soldiers. The second act passed the same day, titled "An Act to amend the Act calling forth the Militia to execute the Laws of the Union, suppress Insurrections, and repel Invasions, approved February twenty-eight, seventeen hundred and ninety-five, and the Acts amendatory thereof, and for other Purposes" (commonly called the "Militia Act of 1862"), took this one step further. It authorized the President "to receive into the service of the United States, for the purpose of constructing intrenchments, or performing camp service, or any other labor, or any military or naval service for which they may be found competent, persons of African descent, and such persons shall be enrolled and organized under such regulations, not inconsistent with the Constitution and laws, as the President may prescribe" (12 Stat. 597). This act allowed for the mustering of African American soldiers into the United States Army. Following the Emancipation Proclamation issued by President Lincoln effective 1 January 1863--which freed all slaves in the Confederate-controlled South--the War Department raised several regiments of African American soldiers. The 1st South Carolina Volunteers, mustered on 31 January 1863, was comprised primarily of newly-freed African American men. The Governor of Massachusetts ordered the recruitment of the 54th Massachusetts Volunteer Infantry, organized on 13 March 1863, from free men of color living in New England. On 22 May 1863 the War Department issued General Order 143, creating the Bureau of Colored Troops. All regiments created after this date were designated "U.S. Colored Infantry," etc. Regiments mustered earlier by the Army or individual states (like the South Carolina and Massachusetts units noted above) were eventually absorbed into the United States Colored Troops. Federal census records. The 1890 census included a schedule for Union veterans and their widows, surviving for the states from Kentucky through Wyoming (listed alphabetically). The 1910 and 1930 census enumerations both included questions about military service, including surviving veterans of the U.S. Colored Troops. Obituaries. Many obituaries for veterans mentioned their military service. Some noted membership in the Grand Army of the Republic (or "G.A.R. "), a fraternal organization for honorably discharged Union veterans. Grave markers. Government-issued military markers may (or may not) list exact service. Other tombstones might list a regiment, state "Civil War veteran," or have a symbol such as the G.A.R. insignia. In addition to these records, the National Archives and Records Administration (NARA) published the microfilmed Index to Compiled Service Records of Volunteer Union Soldiers Who Served With U.S. Colored Troops (NARA microfilm publication M589, 98 rolls). This index also served as part of the source for the National Park Service's Civil War Soldiers and Sailors System database. During the 1890s, nearly all of the records in the federal Adjutant General's Office relating to Civil War service were extracted onto individual cards for each document and soldier. Each of the cards provides all of the information from the original records pertaining to each soldier. These cards were then compiled into files for each soldier. They are quite aptly called "compiled service records" or "compiled military service records," under the series "Carded Records Showing Military Service of Soldiers Who Fought in Volunteer Organizations During the American Civil War" in Record Group 94 (Records of the Adjutant General's Office). Quite a bit of information can be found in the typical compiled service record. The record usually provides the place of birth, age, place of residence, and occupation of the soldier; when, where, and by whom enlisted; presence on muster rolls (usually bimonthly); and date and place of mustering in and out. Other information might include injuries, illnesses, and promotions. The original compiled service records are available for viewing at Archives I in Washington, DC. Some, but not all, of the records for U.S. Colored Troops regiments have been microfilmed by the National Archives, in several microfilm publications, by regiment. The index and digital images are available both on Ancestry.com. U.S. Civil War pension files, when available, can be among the most valuable records that a genealogist can use. Pensions were made available to Civil War veterans under several acts of Congress. The first pension act, "An Act to grant Pensions" (12 Stat. 566) was passed on 14 July 1862. It instituted a pension system called the "General Law," which allowed pensions for soldiers incurring disabilities due to their service, and for the widows, minor children, and other dependant relatives of soldiers killed in action. The second act, "An act granting pensions to soldier and sailor who are incapacitated for the performance of manual labor, and providing for pensions to widows, minor children, and dependent parents," commonly called the "Disability Act of 1890" (26 Stat. 182), loosened the rules concerning pensions greatly. It allowed pensions for any disabled veteran--regardless of the source of their disability--and any widow, minor child, or dependent parent of any deceased veteran. Later acts revised these two laws, including amendments for pensions based on the age of the veteran or widow and the length of service. The pension application process began with a signed declaration by the applicant. Depending on the law under which the pension was being applied, these declarations may provide varying information regarding either disability or age. The circumstances of each case dictate what other information the pension file may contain. 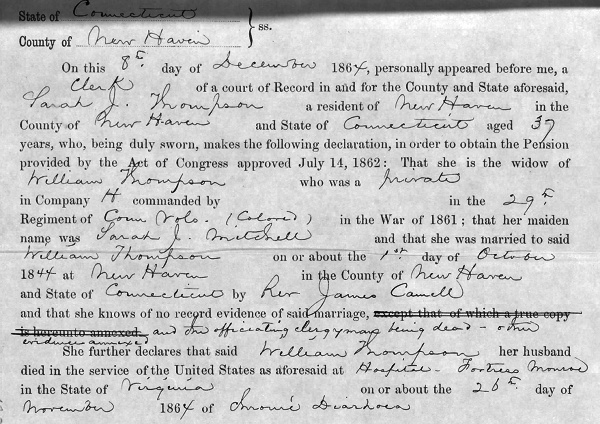 The files may include depositions and certified copies of records proving date and place of birth, date and place of marriage, kinship, slave ownership, disabilities, migration, and death--not only of the soldier himself, but also other relatives, especially the widow, minor children, and dependent parents or siblings. The files sometimes contain pages from family Bibles or baptismal records. Pension file of Sarah J. Thompson, widow of William Thompson, 29th Connecticut Colored Regiment, Pension WC62469. To find out whether your veteran ancestor received a pension, there are two microfilmed indexes produced by the National Archives. The General Index to Pension Files, 1861-1934 (NARA microfilm publication T288, 200 rolls), is organized alphabetically by the surname of the veteran. An index and digital images are available on Ancestry.com. The Organization Index to Pension Files of Veterans Who Served Between 1861 and 1900 (NARA microfilm publication T289, 200 rolls), is organized by the unit in which the veteran served, and then alphabetically by surname. The index and images are available on Fold3. The original files are held at the Archives I facility in Washington, DC. They have never been microfilmed. Fold3 has uploaded nearly four million images of widows' pension files, amounting to about 4 percent of the collection. You can <href="#mail">order copies of pension files from NARA for a fee. The adoption of the Thirteenth Amendment to the U.S. Constitution on 6 December 1865 forever abolished slavery and other forms of involuntary servitude based on African descent. The U.S. victory during the Civil War led directly to its passage. The African Americans soldiers who bravely served during the Civil War thus played an integral role in ending slavery. The records that were created as a result of their service is a treasure for genealogists.